Linus has taken a break while he worked on his tooling to be more socially acceptable. That time is over and Greg KH has officially handed the kernel back to him. We discuss the implication of his return and what it might mean for Linux. A Google contract has been leaked that shows Google is requiring it’s hardware partners to maintain security patches and updates for at least 2 years. 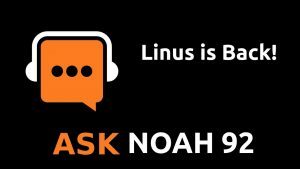 All that and more in this special edition of The Ask Noah Show!